This article is the last in a series that formerly appeared in the Clarion print and online editions. You can find Part I here, Part II here, and Part III here. For more of Dr. Bombaro’s work on Jonathan Edwards, be sure to check out his 2011 book on Jonathan Edwards’s Vision of Reality: The Relationship of God to the World, Redemption History, and the Reprobate. 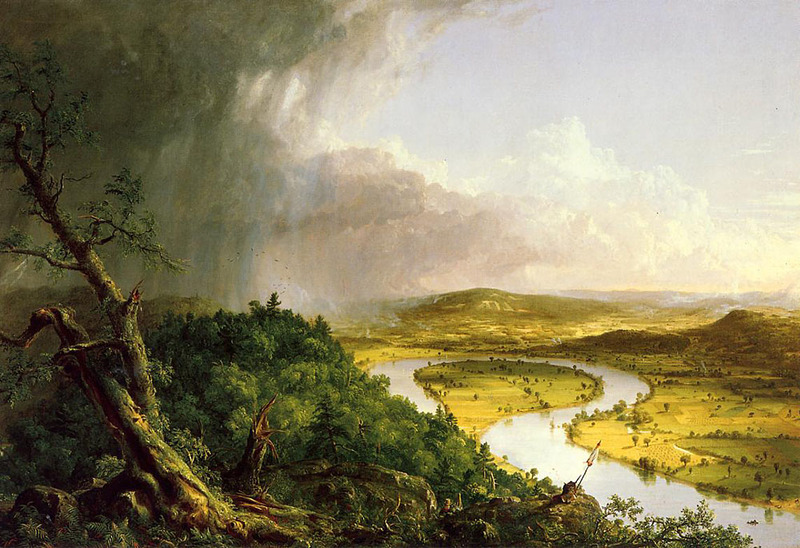 Thomas Cole, The Oxbow (1836). A storm passing over Northampton, Mass., where Edwards had preached. GLORY OF GOD. For God to glorify Himself is to discover Himself in His works or to communicate Himself in His works, which is all one. This conviction emerged from his analysis of: (1) God’s relation to the world, which he perceived to be so purposeful, ordered, and consistent as to be law-like; (2) Newtonian physics in which the world’s phenomena were understood to be mechanistic and law-like; and (3) his grasp of both biblical anthropology and eschatological fulfillment. These ideas meet in telic dispositions: the world according to Edwards is established as a network; God’s relation to the world is conducted through law-like principles. To be sure, the world in fact is an ideal one (Edwards never loses his phenomenological idealist grip), but one that can be described and understood in terms of law-like dispositions. Edwards explains that there are two ways in which God operates, arbitrarily (an unmitigated and simple mental exercise) and naturally (operations that are “limited” by fixed laws, which God establishes by his arbitrary operation). The one is unsounded and impenetrable; the other is regular and established. Edwards’s analysis of all created phenomena, mental or otherwise, rests upon the latter. Not only are all ideas “communicated to us, and to other minds, according to certain fixed and exact established methods and laws” by God, but even God’s ideas about the world are “constant and regular,” due to God’s “infinitely exact, precise and stable will.” Consequently, Edwards writes that “God is pleased to act by Rules which He fixes: thus the Law of nature – the Laws by which natural effects are produced.” Therefore, if, as Edwards says, “the very being of created things depends on laws, or stated methods fixed by God, of events following one another,” then it would not be difficult to see how God may both be in – as well as in control of – all things. This is evident by conceiving of them as telic-oriented principles, that is, as law-like dispositions, whereupon “such actions upon such occasions should be exerted.” The same applies to the reception/perception of ideas: all things are composed and regulated by divinely established and empowered law-like dispositions. In the present and final installment of this four-part series, we take a necessary excursion into Edwards’s meaning of disposition and examine how, in his conception of God comprehending the created order, dispositions are used to explain God’s relation to causality, material bodies, and created existences. Or, in other words, how he applies his theocentric metaphysics to evidence God’s comprehension of everything. This will lead us into a consideration of Edwards’s innovative conception of God’s triunity, upon which his ontology and calculus of value for human beings are based. When discussing the aforementioned, the foundational work of Sang Hyun Lee proves helpful (Sang Lee, henceforth). Yet it still requires a correcting of his over-applied template of dispositions and reductionistic approach to Edwards’s thought. In what follows, we see that Edwards still owes a debt to Aristotelian substance ontology notwithstanding his patent Platonism. And – when envisioning the world in theological categories – he has what are tantamount to Neo-Platonistic commitments. The world according to Edwards is unique, and he does not seem to mind if he rides roughshod over classical philosophy – stealing from Aristotle to pay Plato, as it were. Five things made Edwards’s use of these telic-oriented, dispositional concepts possible. First, it was entirely permissible. Here I am not talking about the intellectual climate of the Enlightenment, but Edwards’s own theological heritage, which traditionally employed dispositional concepts. As Sang Lee points out, Reformed theologians and Puritan divines like William Ames, John Owen, and Thomas Shepard found it permissible to apply the nomenclature of disposition to theological subjects. Secondly, Edwards would have been familiar not only with the theological employments of disposition, but also the accommodating definitions provided by the logicians he read at Yale. Third, a “theocentrism of ends” did not conflict with the usage of dispositions, but rather complemented it. For example, in his way of thinking, a dispositional property is a potentiality directed toward a specific development or end: hence its telic-orientation. A disposition, then, is a capacity to do something which an object possesses. Like most Aristotelian terms, there are analogical uses of disposition. Also for Edwards there are ontological dispositions that constitute the ontic structure of relational existence (more on this below). Fourth, dispositions could be defined and employed in such a way as to be theoretically compatible with the nomic regularity of Newtonian science, which had become the touchstone for any proposal discussing the phenomena of the universe. And lastly, there was Edwards’s disappointment with John Locke’s failure to resolve being into a something, “which we know not what.” What Locke did not know about essence and substance, Edwards was ready to ascribe to God – and he was ready to do so in terms that either combined the use of “substance” and relational dispositions or simply employed the latter (e.g., matter). He was also ready to blame the deficiencies of Locke’s ontology on the empiricist’s positivism and nominalism. For Edwards, dispositional concepts offered a plausible and coherent alternative to understanding perceived reality because they deferred the origination, continuation, and termination of all existence and causality to God. This, of course, gelled nicely with his Calvinist view of divine sovereignty. Dispositions, then, were not only essential for Edwards’s characterization of the world they also served as an important feature in his metaphysical theory of being: “[The soul’s] essence consists in powers and habits.” Dispositions were no nominalistic device, they were real; their structural components – relations – were universals; and relational dispositions constituted the essential structure of reality. Sang Lee additionally explains that it was Edwards’s realist reconception of an original Aristotelian concept of hexis (and later, Thomas Aquinas’s idea of habitus) that made his metaphysical reformulation of reality possible. But this is not to say that Edwards was a metaphysical, direct, or representative realist. Where, on the one hand, metaphysical realism represents the view that there are “real” objects (usually spatiotemporal objects) that exist independently of our experience or our knowledge of them, and have properties and enter into relations independently of the concepts with which we understand them, Edwards, on the other hand, ardently holds to an anti-realist idealism in respect of the creation. That is, with respect to the real existence of abstract ideas Edwards is Platonistic: there is, for example, real beauty without created perceiving minds. But with respect to the world, Edwards is a thoroughgoing idealist. The created world abides as a system of the permanently fixed general laws or tendencies that God has established and according to which he causes actual existences (actual ideas) in time and space. The world, therefore, exists abidingly in the mode of virtuality or real possibility that is a midpoint between pure potentiality and full actuality. In asserting this, however, Lee has been incautious on three counts: by not strictly identifying such “actual existences” with ideas of divine power; by not explicitly stating that the source of such realism for Edwards lies in the disposition’s peculiar mode of existence in the divine mind; and, by not strictly identifying the “midpoint” as the divine power, which moves a thing from a “before” existence to an “after” existence. In Edwards, dispositions’ relation to God is understood in the following ways: (1) their applications are the “immediate” exercising of God’s power (corresponding with Edwards’s occasionalism); (2) inasmuch as God’s power cannot be conceived of something foreign to His peculiar essence, then even those dispositions are, in some sense, of and in God Himself as an idea of how His power would be concerning the world; and, (3) the source of their abiding “reality” (prior to an actual manifestation/application) lies in their enduring in the divine mind. [The] truth as to external things, is the consistency of our ideas with those ideas, or that train and series of ideas, that are raised in our minds according to God’s stated order and law. Man, or intelligent beings, are the consciousness of creation, whereby the universe is conscious of its own being, of what is done in it of the actions of the Creator and Governor with respect to it. The point toward which Edwards is moving holds that the idea of “external things” and the laws that govern them have a certain mode of reality before (even beyond) their existence in created minds. Ontologically speaking, the laws that govern the particulars of a given entity x have a particular mode of existence without the perception of an intelligent perceiving mind. However, this is not to say, as Morimoto does, that Edwards has left behind his idealist or immaterialist position. Rather, it has become more idealistic as his causality becomes more occasionalistic. Though divinely constituted laws are prior to perception, yet unless there is an intelligent perceiver within the realm in which those laws have their tendency, they will not have the occasion to be, as it were, in that domain. In God’s determination of values they had “as good not be as be” without perceivers. The way that they become phenomenologically real or conceptually present is through God’s communication of the idea of those laws or dispositions in some intelligent perceiving mind. But the presence of some mind does not cause God’s idea to be communicated. No relation or connection causes or stimulates occurrences. Instead, God Himself brings about particular results. The arrangements upon those occasions are simply a matter of some “fitness” determined by God’s infinitely wise arbitration. Yet laws and rules that God determines govern the particular non-causal connections and their corresponding results. The divine power to effect results constitutes the midpoint between cause and effect – a law-like disposition or tendency toward some particular effect. While Edwards understands that a disposition has a mode of ontological existence independent of intelligent perceiving minds, yet it is only as a certain idea of God’s power. An abiding dispositional law (that is, one that has not been communicated to a created intelligence) does not have a quasi-independent metaphysical reality apart from the divine mind. And neither does it consist of something other than God’s power – a point which Lee himself admits. Rather, prior to the creation of angelic or human minds, they abide only as a certain determination in the divine mind and, even after the temporal presence of intelligent perceiving minds, they are entirely dependent upon God to continuously conceive of them as such. They are also dependent on God to communicate the idea of His power manifested in a particular way: as a thing or event. Their “abiding” existence, then, lies in the notion that they continue as law-like ideas of how God’s power will be exercised when those ideas (in the divine mind) are communicated to other minds. When the divine idea of any thing is communicated to an intelligent perceiving mind it becomes concretely “real” to that mind. That is, the idea of that thing gains a phenomenological or conceptual realness to/in that created mind and may be deemed an “ad extra” manifestation of divine power or beauty or being. Thus, it is only in the sense that the source of such realism lies in the dispositions’ peculiar mode of existence (an idea) abiding in God’s mind that Edwards can be considered a philosophical realist. Though we suppose that the existence of the whole material universe is absolutely dependent on idea, yet we may speak in the old way, and as properly and truly as ever: God in the beginning created such a certain number of atoms, of such a determinate bulk and figure, which they yet maintain and always will; and gave them such a motion of such a direction, and of such a degree of velocity; in a continued series. Yet all this does not exist anywhere perfectly but in the divine mind. But then, if it be inquired what exists in the divine mind, and how these things exist there, I answer: there is his determination, his care and his design that ideas shall be united forever, just so and in such a manner as is agreeable to such a series. All the ideas that ever were or ever shall be to all eternity, in any created mind, are answerable to the existence of such a peculiar atom in the beginning of creation, of such a determinate figure and size, and have such a motion given it. That is, they are all such as infinite wisdom sees would follow, according to the series of nature, from such an atom so moved. That is, all ideal changes of creatures are just so, as if just such a particular atom had actually all along existed even in some finite mind, and never had been out of that mind, and had in that mind caused these effects which are exactly according to nature, that is, according to the nature of other matter that is actually perceived by the mind. God supposes its existence; that is, he causes all changes to arise as if all these things had actually existed in such a series in some created mind, and as if created minds had comprehended all things perfectly. And although created minds do not, yet the divine mind doth, and he orders all things according to his mind, and his ideas. The perception of reality or a thing perceived as conceptually or phenomenologically real or actual is a consequence of an intelligent perceiving mind’s consciousness of the Divine Being’s idea about reality or that thing; it is the “truth.” The appearance of change or permanence lies in the presentation of the divine series in/to perceiving minds. To the perceiver, that communicated series is reality. To God, reality’s mode and prescribed content never changes: it consists in a perfect idea of a communicated and remanated “series” of ideas. In Edwards’s theocentric metaphysics, the created mind’s perception of a thing – the idea of that thing in God’s mind which He conceives of as communicated to that mind – is, in effect, the creature becoming conscious of “Being in general.” Reverting to our previous discussion, Edwards’s realism must be understood in terms of degrees of coherence: his is no correspondence theory of truth or reality, for the belief that instance p is true if and only if p cannot obtain verification without an ontological basis (God), which connects all instances p to an entire system that is consistent and harmonious – Being in general. Universals (e.g., relations), then, must be understood as patterns or blueprints that exist in the mind of God, where they are real and where dispositions have a prior ontological reality. Their reality in the divine mind is perceived by created mind in degrees, either expanding or contracting their relationally determined perspective of a single system of reality, Being in general. This perceived reality (communicated by God, of course) is the reality of created minds, no matter what degree of it they perceive. If we consider this in connection with Edwards’s “scale of being” we get an idea of how “value” and “substantiality of being” are estimated: the greater the degree of a created mind’s perception of ideas communicated from the divine mind, the more that created being is conscious of “Being in general,” and therefore the more “consent” to being it has. The more consent to being, the more “excellency”: the more “excellency” the more like God it becomes and, therefore, the more real or substantial. Conversely, the opposite holds for material entities. Edwards’s theory of dispositions regarding causality is distinct from those of select contemporary physical and psychophysical theorists in two qualified ways: (1) the ontological reality of dispositions apart from circumstantial manifestation; and (2) the reality of dispositions, whether or not they are observed by created minds. As stated, Lee would have no difficulty with (1) and (2), for he asserts as much in his own writings. However, important qualifiers must be added. Both (1) and (2) are qualified by Edwards’s idealism and occasionalism in that they limit the “perceived reality” of unmanifested dispositions to a “virtual” status, a mid-point between cause and effect which Edwards denominates “power.” They ultimately resolve both the disposition and its manifestation to ideas of God’s power and beauty – an arrangement determined and effected by God. Hence, the ultimate source of their reality lies in God’s idea of Himself or, synonymously for Edwards, His essence. In memory, in mental principles, habits, and inclinations, there is something really abiding in the mind when there are no acts or exercises of them, much in the same manner as there is a chair, in this room when none perceives it, we mean that the minds would perceive chairs here according to the law of nature in such circumstances. So when we say, a person has these and those things laid up in his memory, we mean they would actually be repeated in his mind upon certain occasions, according to the law of nature. By asserting that the “laws of nature” (“which God hath fixed”) do not solely rest in the sphere of epistemology, but also ontology (“there is something really abiding”), Edwards underscores a critical facet of his account of dispositions. As he describes it, ontology is the foundation of epistemology; it sets epistemic limits: the science of knowledge is not separate from the question of existence. Disposition is more than occurrent; it possesses a mode of reality independent of perceived events as a general law that governs the manner or character of actual existence, actions, and events, through which it gains external acknowledgement – and here is the critical part – only when that idea in the divine mind is communicated. As we noted in a preceding section, the idea of manifest reality in God’s mind consists of a determined “series of ideas.” When viewed as a whole, the series is the world, the matrix of reality, God “ad extra.” When viewed characteristically, the series is a network of law-like dispositions regulating God’s power toward specific exertions. The way the series achieves “ad extra” manifestation is through a divinely determined occasionalistic scheme. Edwards’s own unique brand of occasionalism is a twofold doctrine, emphasized in one of two ways: idealistically, or concerning the phenomena of causal occurrences. The first part of his twofold doctrine pertains to his “idealistic occasionalism,” to which I have referred earlier. Within this larger and overarching set, God utilizes perceiving minds to produce the effect of Himself communicated – the matrix of reality. The arrangement is one of God emanating and remanating ideas to/from perceiving minds. Subsumed within the first part, is the second, which assumes the idea of an initially manifested world and takes note of causal occurrences therein. To be sure, God is the causal power in both. Within Edwards’s idealistic occasionalism the ideas of why God created the world and how He effects its initial achievement come together. God’s end is to glorify and replicate Himself “ad extra”. Perceiving minds provide the occasion, not out of absolute necessity, but because God determines it so: “[T]he creatures are made that God may in them have occasion to fulfill his pleasure in manifesting and communicating himself.” God in His own wisdom determines that without perceiving minds, the world would be valueless (Edwards’s weak necessitarian view.) Therefore, God prescribes intelligent perceiving minds a role, not as causal agents, but as a condition in His scheme. Their “necessary” role in God’s arrangement (why God “needs” them) concerns the world’s value to God. They provide “minds” by which God may have His idea of Himself “ad extra” “remanated” back to Himself. The benefits intelligent perceiving beings receive in this arrangement and the love or pleasure God enjoys in such self-giving are altogether different matters, matters of theology, matters of soteriology. How does Edwards know that dispositional laws pertaining to occasionalistic causality abide in the divine mind? He answers, “’Tis discover’d in the Constancy of the Laws of nature.” As a follow up question one might ask, If general laws or dispositions are not exercised, what then is their status of existence when in a state of inactivity? Again, the answer is that they are a completed series in God’s mind; they only are perceived in or as a temporal series by created minds. The “virtual” status of unmanifested dispositions pertains more to the created mind than to the divine mind. Thus, when Edwards says that “God supposes [a thing’s] existence,” he is not saying that “virtual”, “potential”, and “mere possible” realities are real states of consciousness for God about things. Rather, God supposing the existence of a thing is His determination of the series of that thing’s perceived reality from the perspective of a created mind. “Suppose” and “virtual” are temporal referents. For God, the movement from virtuality to communicated reality is meaningless – the idea “is always the same and after the same mode.” God knows “real” only one way: hence His timelessness and changelessness and perfection. The creature, however, remains subject to a linear or chronological progression of existence, where things become “real” or “actual” in their minds. When Edwards discusses things from the perspective of the creature, he speaks from within the framework of a linear progression of temporal series (more on this later). Thus, in his causal theory a cause is that “after or upon the existence of which, or the exercise of it after such a manner, the existence of another thing follows.” What connects the idea of a prior existence to that “after” existence is “power”: “The connection between these two existences [past and present], or between the cause and effect, is what we call power,” writes Edwards in “The Mind” notebook. [It] should be remembered, what nature is, in created things: and what the established course of nature is; that … it is nothing, separate from the agency of God…. A father, according to the course of nature, begets a child; an oak [likewise] … produces an acorn, or a bud; so according to the law of nature, the former existence of the trunk of the tree is followed by its new or present existence. In the one case, and the other, the new effect is consequent on the former, only by the established laws, and settled course of nature; which is allowed to be nothing but the continued immediate efficiency of God, according to a constitution that he has been pleased to establish. The immediacy of God’s activity is not removed though laws are used. This, of course, is consistent with standard definitions of occasionalism, in which ipso facto laws cannot be causal, but they can be divine regularities at the creaturely level of observation. Thus, it is through laws, which govern divine causal powers, that God affects the result of created reality. When Edwards refers in his etiology to dispositions or habits, he means active and real tendencies, not merely conventions or even a Humean “general regularities,” because of their place within a series or a network, or, in other words, because of their relation to the whole series of ideas concerning the reality to be communicated to perceiving minds. In this way, Edwards’s occasionalism stands akin to the ontological status of Malebranche’s ideas. Quoting again from “Miscellanies” No. 241, Edwards says, “All habits [are] a law that God has fixed, that such actions upon such occasions should be exerted.” “Should” is not to be understood as “could” but really as “would,” even “certainly would.” For Edwards, an active tendency to a kind of phenomenological event will actually bring about such an event whenever a certain divinely prescribed set of conditions within the series is present. Failure of occurrence simply is not possible due to any given disposition or thing’s status within a “series.” Dispositions then function with a kind of conditional necessity, in which God moves an event associated with a certain dispositional manifestation from its status within the divine series to “actual” occurrence or phenomenologically or mentally “real” with respect to created minds. “Philosophical necessity,” Edwards says, “is really nothing else than a full and fixed connection.” Necessity therefore lies in a particular connection with certain conditions. It is the connection within the divine series itself that assures that necessity is “nothing different from certainty.” The active tendency of disposition is necessitated by its connection with certain conditions, a law of relation, which God establishes. Dispositions or habits may be designated causes in this sense. Thus, dispositions function with a kind of necessity in bringing about a type of event or operation under a type of circumstances. These circumstances, which include the ideas of time, locale, and prescribed variable or variables, ascribe individuality, particularity, or identity to events and things. though it is made up of innumerable series of instances. The priority of God in Edwards’s system means that it is God who constitutes how laws exist and in what manner they are communicated or fully realized as actual ideas to perceiving intelligent minds. Both metaphysics and physics emerge out of the “necessary being” and the “natural operations” of God. Lee’s appraisal and articulation of Edwards’s dispositions simply do not hold the all-determining status he intends. It is Edwards’s concept of God that reigns in Lee’s over-application of dispositions and the Puritan’s own occasionalism keeps them on a leash. In Edwards’s first engagement with Enlightenment religion we find him countering the materialists’ purge of the spiritual by nullifying the “substance” of matter. Shortly thereafter he adds to his reasoning that, if God is “Ens Entium” and present with the universe itself, then the possibility of there being competing substances (such that Newtonian physics proposed) with the “substance” of God is implausible. To him, even the least molecule outside of the immediate controlling power of God jeopardized divine sovereignty and compromised the doctrine of God’s comprehensiveness. Therefore he countered with a critical analysis of solidity or “resistance,” which was counted as a universal and essential property of matter, and concluded that this infinite power of resistance could not reside in an underlying substance, but rather must be a constant exercise of the infinite power of God. Far from being undiscoverable by logical analysis, God alone is “substance” while matter is the immediate effect of the exercise of the infinite power of God. “Resistance” itself came to rest on dispositional principles and came to play an important role in explaining Edwards’s conception of reality. Indeed, the principles of the early composition “Of Atoms” were never abandoned; instead, they were brought into harmony with his developing idealism and philosophy of dispositions. As we noted earlier, existing, for Edwards, occurs only in accord with general laws. The logic of which meant that laws not only constitute the abiding dimension of an entity as a disposition, but also determine the manner of its existence. Existence, as Lee explains, is in a particular manner – in the particular way a particular divinely established general law requires. Laws, then, are the abiding principles of the structure and order of reality. “Therefore,” Edwards says, “we may infallibly conclude that the very being, and the manner of being, and the whole of bodies depends immediately on the divine power” or Being, who causes “indefinite resistance in that place where it is” according to fixed laws. Thus, material bodies themselves exist in a particular manner – resisting – according to the demand of a particular divinely established law, or the divine being exerting power in a law-like manner. For Edwards, the question of material bodies is not so much what exists but how. The concept of “resistance,” which appears in Edwards’s explanatory corollaries to his propositions on the being of entities, is an essential part of his “idealistic phenomenalism” response to the materialism of Hobbes, as well as the undiscoverable “substances” of Newton and Locke. In opposition to the materialism of Hobbes, his main point is that the very existence of bodies depends immediately upon the exercise of God’s infinite power, and that bodies do not exist by themselves as substances. Instead, the material world “can exist nowhere else but in the mind, either infinite or finite,” or again, “corporeal things exist no otherwise than mentally, either in created or uncreated consciousness.” According to Edwards, then, a material entity is not Locke’s something, “which we know not what,” or a subject to which solidity or the activity of resisting inheres, but rather a body is solidity – resistance from annihilation itself. For a body to be is for there to be resistance of a certain kind at a given time and place. Resistance or the extension and cohesion of bodies is the activity of God’s infinite power, for only God can offer the power necessary to resist annihilation. Consequently, material bodies are not substances that exist independently, but “the Deity acting in that particular manner in those parts of space where he thinks fit.” By removing the “material” substance from materialism, Edwards makes sense of his seemingly paradoxical statement, “No matter is, in the most proper sense, matter.” In general, however, his idealist-phenomenalistic view of the physical universe retained and emphasized its character as a Newtonian system of physics. So, then, there are three important things to note here: First, in accord with preceding sections, the meaning of material substance has changed for Edwards from a medieval to a modern conception, as Sang Lee has rightly stated; second, the activity of resistance itself is existence or being of bodies or bodies themselves; and third, the resistance activities caused by God are divinely established laws or, in other words, God’s power exercised in a law-like fashion. “Material substance” is reduced to the activity of resistance, or is dismissed altogether with reference to bodies. So that, if one were to speak of material substance as it appears in Edwards’s scheme after mid-1722, one ought not to be speaking about the Aristotelian-Scholastic tradition of the ultimate underlying “stuff” or concreta which theoretically composed the “what-ness” of bodies. Edwards understands God’s power to be the “substance” of bodies: “speaking most strictly, there is no proper substance but God” (“Of Atoms”). Edwards’s conceptual approach to matter, as well as its conclusions, differ as widely as the predestined “end” of saints and reprobates. The manifest analogy between the nature of the human soul and the nature of other things; how laws of nature take place alike; how it is that laws constitute all permanent being in created things, both corporeal and spiritual. In how many respects the very being of created things depend on laws, or stated methods fixed by God, of events following one another. The comprehensiveness suggested by his proposal leads to the conclusion that laws do more than “constitute all permanent being in created things, both sentient and nonsentient,” that they in fact are the principles of being for created existences, just as Sang Lee suggests. When referring to spiritual or perceiving beings, Edwards wrote in “Miscellanies” No. 241 that, “the [soul’s] essence consists in powers and habits,” meaning that “powers and habits” (dispositions) do not merely belong to entities as a type of component, but rather they are constitutive of their being. Edwards expresses the same point at times by associating the Divine Being closely with the divine power. The difference between the Divine Being and created existences lies in the fact that God is the One who “constitute[s] all permanent being” in “laws, or stated methods.” While created existences can in some sense be reduced and said to be “dependent on” law-like dispositions, yet God cannot, though they are essential to His being. And in this respect, Sang Lee errs. Insofar as powers and laws are associated with dispositions, bodies, beasts and sentient entities do not merely have dispositions, but are, for all intents and purposes, law-like dispositions; and, as Lee explains, dispositions are the essence of things, albeit with certain caveats for intelligent perceiving beings. For instance, Edwards insists that such essential dispositions have a locus. To be sure, Edwards has abandoned the Aristotelian-Scholastic idea of the material world, but nevertheless maintains a concept of “substance” as a locus for the essential dispositions of “spirits” and sentient beings. By doing so, Edwards is proposing a dispositional conception of all created existences, of all perceived reality, in order to facilitate his vision of telic-theocentricity and which also remains in keeping with customary notions of imago Dei and the analogia entis. In the end, the logic of God’s “comprehension” of created reality not only posits necessary dispositions to God, but inasmuch as God’s “expansive” disposition encompasses the temporal realm as a matrix of divine beauty, then all things are rendered compositions of dispositions. [It] seems evident that his new concept of being, when applied to the divine perfections, stands in sharp contrast to the long tradition of philosophical theology into which he was born. God’s goodness is not grounded in the absolute unity and simplicity of his being, but belongs to him only as he constitutes a plurality involving relations. Edwards then applies these three relational principles to his “scale of being,” by employing his philosophy of dispositions to depict their teleological significance. For inasmuch as God’s emanationistic activities through the created order have one telic purpose, viz. the glory of God, created existences are included in that functional end. In this way, the external, expansive character of the divine beauty is explained through the “scale of being,” where God’s infinite being encompasses external existences. According to Edwards, all value and substantiality (realness) of being on the scale is understood in terms of nearness to God and other beings through “mutual consent.” Thus, beauty or the relationality of “excellency” determines the ontological status and value of all being, including humans, even reprobates within a double predestination schema. So, just as Edwards predicates the whole scale of created existences upon ontological arguments for a necessary being, so too his analysis of being in terms of excellency rests upon God; this time in terms of necessary beauty and plurality. In other words, Edwards gives philosophical depth to his philosophy of being by modeling the ontological structure of created existences upon his trinitarian formula and analysis of God’s constitutive inner relations. What is more, God’s relational excellence is not external to God but, inasmuch as God’s relational excellence is His idea of Himself “ad extra” (replicated in other minds), it must be considered internal, according to Edwards, and therefore constitutive of the Divine Being’s essential idea of Himself. It is the internal dynamics of God that provide Edwards’s metaphysical rationale for divine comprehensiveness and the unity, interrelatedness, and connectedness of the matrix of existence, as well as his own penchant for panentheistic expressions of these things. In the outcome of Edwards’s trinitarian formulation we find that the most important implication of his definition and use of excellency is that every real being must, as a condition of its existence, stand in some relation to other things, and ultimately to all other things. This, of course, implies that the universe itself is necessarily pluralistic and bound to God’s being in a matrix of relations. Consequently, the ontological status of perceiving beings in terms of substantiality or realness on the “scale of being” is defined by the extent and quality of their relation(s) to other beings. Lee delineates the contents of Edwards’s model for ontological structure, to show the plurality of the universe as well as its inner relational composition, by correctly presenting its three maxims. “First of all,” says Lee, “what an entity is, is inseparable from its relations.” Just as the inner being of God is explained through dispositional and relational concepts, so too created entities, modeled after the defining inner plurality of the Godhead, are likewise presented with relational necessity. With God, however, there is a peculiar internal uniqueness which does not permit existences outside of the Godhead to be ontologically defined in a manner identical to God: “’Tis peculiar to God that he has beauty within himself, consisting in being’s consenting with his own being, or the love of himself in his own Holy Spirit.” For all existences outside of the Godhead, being is determined by how an entity is related with other entities and to God. With God, however, existences are comprehended by His being. Either way, determinative relations are not external but internal to being. Lee identifies the second maxim of Edwards’s relational conception of the structure of being as: “relations determine the existence of an entity.” Since laws (dispositions) are the quality of resistance (existence) itself, laws must be exercised if there is to be existence. And, since the exercise of laws (the relation of relationships) can only mean a multiplication of relations of particular sorts, entities cannot actually exist without actual relations. In other words, the relationality of the created order does not admit that any one of its pluralities of entities is an ultimate substance or stark singularity in the sense that it can exist independently of all others, or that it can have any unity, autonomy, or self-identity apart from the relations in which it stands to others. There is no aseity outside of God. This is not to say that all individuality is extinguished in a particular entity because of its relational constitution. Bodies, we remember, exist in a particular point in time and space, and have a particular functional purpose (telic-orientation) in their divinely determined existence. Nevertheless, entities never enjoy pure individuality: “Since the law that governs the individual activities of resisting [existing] is a relation of relations, the acts of resisting can only be the acts of relating to other entities – that is, the acts of resisting in a particular sort of relationship with other entities.” The result is a nexus of laws of dispositions, a matrix of excellent relations or existences. Therefore, a being is not only defined or constituted through its relations, but it also exists only through its relations. The whole of reality is, as it were, a network or matrix of interrelated relationships. The third element of Edwards’s model for ontological structure has to do with the extent of the mutual relations of all entities. In Edwards’s ontology, an entity’s structure is defined as a law or a nexus of laws. And since laws are relations of relationships, the very existence and the essence of an entity is inseparable from its relations. The most fundamental logical ground for such a perspective is Edwards’s contention that the universe is the external expression and repetition of God’s internal being. Since God is a unified being (with internal plurality), then His ad extra existence must be a unified system. In sum, what a thing is is also determined by its “tendency to be related with other entities” in a manner harmonious with the law of the whole, that is, with the beauty of God. The beauty or excellency of God, then, is the standard, the point of reference, the goal or “end” of creation, as well as the foundational and defining reality for all other beings. Being is not simply determined by being-in-relation, even to the whole of being (point number two), but being’s quality and quantity of being-in-relation. Being-in-relation necessarily means being part of the network or matrix of relations and, to a degree, related to all relations. The operative word for Edwards however is “degree.” The degree of being’s “substantiality” is qualitatively and quantitatively determined, which, in turn, determines being’s value on the “scale of being” and, therefore, worth to God. The three relational concepts determinative of being are the same with created existences as they are within the Godhead. The three dimensions of relatedness are: (1) the relationship an entity has to itself, (2) to certain other entities, and (3) to the (law of the) whole (i.e. God). A material body, then, is related to itself in its particularity – a resistance in a particular time and place. Secondly, a material body is related to other bodies through the laws which govern that particular type of body. And thirdly, a nonsentient being is related to the whole by virtue of its perceived place with the total matrix of reality. This is how the idea of its existence may be understood as a perceived existence. To Jonathan Edwards, of course, a material body is nothing more than an idea. Dispositions, relations, and a matrix of existences are simply real ideas in God’s mind communicated to intelligent perceiving minds about the perceived reality of such ideas. its consent to the whole (“being’s consent to being”). Likewise, the “happiness” of intelligent perceiving being consists in the knowledge and love of beauty. What does this three-dimensional structure of being mean for the nature of human beings? It means that the essential structure of a human being, first of all, is conceived by Edwards as a nexus of laws that is a tendency to three relationships: to one’s self (where we find Edwards’s trinitarian formula applied to the psychological constitution of intelligent perceiving being), to others, and to the whole (“Being in general”/“Being-as-manifest”). Each relation corresponds to a relation within the Godhead. God’s mind and ontological relations and human minds and ontological relations are parallels of sorts, differentiated by autonomy, necessity of being, and, significantly, by degrees. There is, then, a three-dimensional structure in the essence of a human being, where the first two relational dimensions are governed by the third. Jonathan Edwards’s conversion marked the beginning of not only a spiritual and theological journey, but a philosophical one as well. The “holy disposition” infused into his soul brought with it a capacity to “perceive” reality, as it truly was – an extension of God’s “excellency.” Convinced that the “vision” of God in reality was not his affected narrative but God’s, he set himself to reconstruct the evidence of nature (and, later, history) accordingly. The content of his Spirit-regulated, spiritual sensibilities was, for him, an authentic Christian and spiritual view of the world, one which corresponded to Holy Scripture and, conveniently, concurred with his reading of Reformed confessions. He discovered through his experience that one cannot satisfactorily understand God’s reality in light of man and the world, as the rationalists attempted, but vice versa. Indeed, he learned that the world and all things associated with it were pregnant with cosmic significance through God’s purposeful presence. This was Edwards’s post-conversion starting point, the mental state with which he engaged the Enlightenment and his colonial New England context. The vision of “God as God” took precedence over established theological positions, philosophical theories, and any and all competing worldviews, scientific or otherwise. For, according to Edwards, the worldview it facilitated was the only one that consistently brought together divine revelation, spiritual sensibilities, the power of reason, and scientific observations concerning the physical world, into one compelling interpretive framework of intelligible reality. Thus, in light of its internal and external, subjective and objective confirmation, Edwards began re-evaluating theology, conversion, history, creation, natural philosophy, and anthropology. Despite his unconventional formulation of the Trinity and the panentheistic implications of his account of God’s relation to the world, Edwards nonetheless was willing throughout his career to put his signature to the Westminster Standards. He was always willing to do so, not because he was a hypocrite or a latitudinarian freethinker in sheep’s clothing (or Genevan gown, as the case may be), but because he did not think his speculative philosophical-theologizing was outside the creedal parameters of Reformed orthodoxy. In fact, his hope, if not confidence, was that his intellectual efforts in the realm of metaphysics would set a bulwark against the prevailing modern theologies in Britain and, as he was learning, at Harvard and possibly in seminal form within his own alma mater. True to his covenant faith and heritage, Edwards champions a doctrine of God-centeredness. For him, however, theocentrism is not a single doctrine, but a genus with many species. Characteristic of his thought is a theocentrism of ends. Above all things, what is important to Edwards is that God gets the glory worthy of His being and nature. When he considers Romans 11:28, “for of him, and through him, and to him, are all things,” Edwards emphasizes the “to him” beyond the “for him and through him.” The theological equivalence of his telic-theocentrism lies in the pactum salutis, through which God brings about His glorification in the work of redemption by way of an intra-trinitarian eternal confederation. All things exist for God’s glorification and are part of this divine work. Consequently, all things are tied to and moving toward a programmatic “ultimate end.” Not only is a static God utterly foreign to his thinking, so is a static creation, because, for him, reality itself is the matrix of God’s beautiful being moving toward that “ultimate end.” In fact, divine goal-orientation is so dominant a concept in his thinking apparatus that it remains doubtful he discusses any item in his corpus outside of its aegis. It is not surprising, therefore, to find all things – creation, providence, causality – affected, indeed, subjugated to its agenda. This is what makes Edwards both peculiar and uncongenial to the modern temper. But Edwards goes even further. God is not only central to the believer’s reality, but also the unbeliever’s ontological reality; for God Himself is “real existence,” which “comprehends all being” – even the existence of those outside of Christ. Thus, according to Edwards’s new aesthetic and theocentric vision and the ontic, telic, and cosmic conclusions he draws from it, all created existences derive their being and value from God’s “comprehension.” Which means that God’s comprehensiveness holds both ontological and epistemological consequences for all created intelligence: whether regenerate or not, every man’s metaphysical reality is directly related to, encompassed by, and derived from God. Negatively, however, this all-encompassing self-manifestation of the divine being throughout the created order came with sacramental consequences: outside of the promises of God, one could not put any stock in, for instance, baptism. In itself it becomes no more special than, say, praying in a bog and receiving divine illumination concerning the sovereignty of God. Perhaps here, with Edwards, we begin to see the trajectory of modern evangelical skepticism concerning the sacraments which, at one time in evangelical Reformed thinking, did convert the soul. But as Edwards’s life-story would prove, he lost all confidence in God’s objective work through and presence in baptism (if not the Lord’s Supper) when he pessimistically wrote off his very own congregation as lost unregenerates because they did not yield an approving degree of piety and progressive sanctification. It is remarkable that, for Edwards, God is present everywhere accomplishing His purposes though not especially and uniquely through the sacraments. Here again Edwards ironically shows himself a disciple of Plotinus. In Edwards’s way of thinking, if Reformed theology was to compete in the hostile marketplace of Enlightenment thought (insofar as this was unsympathetic to and failed to have deference for Protestant symbolics regarding divine immanence and all that this entailed in terms of Calvinist soteriology), it needed to articulate its worldview in terms that encompassed all aspects of a reality undergoing a paradigm shift in physics and philosophy. On a sophisticated level, he learned that this could be done through metaphysical concepts of “Being in general,” “being-as-manifest,” and “all-comprehensive being.” Sensibly, these abstractions become concrete or earthy through typological associations in connection with a theology of nature. Whether philosophically or concretely, God’s essential presence and purpose in the world are founded upon three fundamental concepts: excellence, idealism, and law-like relational-dispositions. Edwards’s twofold doctrine of occasionalism serves the latter two. The world is an ideal one, but one manifest and comprehendible in terms of law-like dispositions. The relationality or plurality of the world articulates its beauty or excellence, which, to Edwards, is mental existence, an instance of “excellency” comprehended by God. Edwards’s theocentrism of ends or metaphysics of finality brings his thoughts on excellency, idealism, and relational-dispositions, under one heading to express and explain the single point that God indeed gets His glory. All things in their goal-oriented dispositional structures are therefore predestined, prescribed, and perfectly exercised according to the divine will to glorify God Himself in His ad extra manifestation in spatiotemporality. These ideas especially apply to human agents because, in the world according to Edwards, human beings created in divine image are God’s principle means for accomplishing His self-glorifying ends. This says much about his incarnational theology, but tensions will always remain because of his sacramental and, by implication, ecclesiological pessimism. The Rev. John J. Bombaro, PhD (University of London) is parish priest at Grace Lutheran Church in downtown San Diego. He also lectures in the Theology and Religious Studies Department at the University of San Diego. 1. “Natural Philosophy” also is a collection of essays and scientific notes, which include a number of metaphysical and epistemological essays. For more on the content, composition, and significance of this series see Anderson’s “Editor’s Introduction” to The Works of Jonathan Edwards (26 vols., New Haven: Yale University Press, [1957-] 2008) (hereafter, Yale-Works), 6:29-31, 173-91; see also The Works of President Edwards with a Memoir of His Life, ed. Sereno E. Dwight, 10 vols. (New York: Converse, 1829-30), 1:664-761. 3. “Miscellanies” No. 1263, Yale-Works 23: 202-03, 204. 4. “Miscellanies” No. 1263, Yale-Works 23: 202-03, 204. 5. “The Mind” Nos. 27, 13, and “Subjects to be Handled,” Yale-Works 6:351, 344, 391-92. 6. “Miscellanies” No. 241, Yale-Works 13:358. 7. Lee, The Philosophical Theology of Jonathan Edwards: The Idea of Habit and Edwards’s Dynamic Vision of Reality (Princeton: Princeton University Press, 1988; rev. ed. 2000), 22-25. (Hereafter, Philosophical Theology). This statement, of course, could be extended to include Calvin (see, Institutes of the Christian Religion, I.14.17; III.3.7, 8). While at Yale, JE would have encountered a variety of ideas concerned with “habit” and “disposition” in Dummer’s philosophical and theological literature. 8. E.g. Adrian Heereboord, Logica, seu, Synopseos logicae Burgersdicanae (London, 1658). 9. Locke, An Essay Concerning Human Understanding, II, xxiii, 2. 11. Locke, while continuing to speak of essences, distinguished between real and nominal essences. For him, the familiar objects of common sense are collections of co-present sensible ideas to which we attach a single name like “tree” or “man” or “flower.” Identifying the ideas constitutive of the relevant collections gives us the nominal essence of a tree, man, or flower. He did not deny that real essences might underlie such collections, but he insisted that it is nominal rather than real essences to which we have epistemic access. Essence, therefore, does not equal subsistence in Locke. JE’s rejection of the Lockean account of spirit, mind, and matter, is indicated in “The Mind” No. 11 (c.1724) and “Misc” No. 267 (1726), but becomes explicit in “The Mind” Nos. 70-72 (1748) in connection with personal identity. See Anderson’s discussion on JE’s various points of disagreement with Locke in “Editor’s Introduction,” Yale-Works 6:101-02, 112-17, 128-31. 12. I say this mindful of JE’s provisos about God’s being. Locke, it has been observed, had difficulties with the notion of habit, concluding that mental habits or dispositions were settled by “custom” (Essay, II, xxxiii, 5-6; cf. Lee, Philosophical Theology, 25-32). Thus, the scope of the epistemic function of habit (indeed, if there is one for Locke) is limited only to the aberrational connections among ideas, where habits possess no ontological status. 13. “Miscellanies” No. 241, Yale-Works 13:358. 14. Anderson, “Editor’s Introduction,” Yale-Works 6:83; cf. Fiering, Jonathan Edwards’s Moral Thought, 78. 15. Lee, Philosophical Theology, 10-25. 16. “Edwards on God and Nature: Resources for Contemporary Theology” in Edwards in Our Time: Jonathan Edwards and the Shaping of American Religion, eds. Sang Hyun Lee and Allen C. Guelzo, 28. 18. “Of Being,” Yale-Works 6:206. Dispositions do not determine God’s idea of Himself, but vice versa. 19. See, e.g., “Miscellanies” Nos. pp, 94, 238 and 239 in Yale-Works 13. 20. “The Mind” No. 10, Yale-Works 6:342. 21. “Miscellanies” No. 1, Yale-Works 13:197. Elsewhere, he uses the terms “perception” instead of consciousness to express the same point. The term “perception” may have been more favorable because it could stand for both having empirical contact with physical phenomena and having an idea of spiritual as well as physical things. Although in “Miscellanies” Nos. 3, 87, and 354, for example, JE uses the designation “intelligent beings” (which could be interpreted as something broader than humanity, e.g., angels), “Miscellanies” Nos. gg, 1, 104, 108, and 114, clearly show that humanity is intended by that designation to be “the consciousness or perception of the creation” (“Miscellanies” No. 104, Yale-Works 13:272). The reason for this is discussed in my forthcoming monograph, Jonathan Edwards’s Vision of Reality, cc. 8 and 9. 22. “The Mind” No. 69, Yale-Works 6:385. 24. “The Mind” No. 34, Yale-Works 6:353-54. Italics mine. 25. “Miscellanies” No. 134, Yale-Works 13:295. 26. “The Mind” Nos. 1 and 45, Yale-Works 6:335-36, 362-64. 27. Lee, Philosophical Theology, 42-48. 28. “The Mind” No. 29, Yale-Works 6:352. See “Miscellanies” Nos. 553, 729 (Yale-Works 18), 1337 (Yale-Works 23), where JE uses the words “virtual,” “virtually,” “actual,” “potential,” and “mere possibility” in this connection. 29. “The Mind” No. 69, Yale-Works 6:385. 30. Elwood, Douglas J., The Philosophical Theology of Jonathan Edwards (New York: Columbia University Press), 12. 31. “The Mind” No. 40, Yale-Works 6:357. Indeed, as Anderson confirms: “Nothing is more apparent in [JE’s] theory of supposed existence than that Edwards conceives of generals laws of nature to be ontologically prior to the objects of the world” (“Editor’s Introduction,” Yale-Works 6:109). 32. “Miscellanies” No. 241, Yale-Works 13:358. 33. It is not unlikely that JE acquired this notion of “active principles” from Newton. Lee pursues this thought in Philosophical Theology, 31-34. It may be, however, that JE simply deduced the notion of “active principles” from the telic orientation of created existences. 34. “Miscellanies” No. 448, Yale-Works 13:495. 36. MS sermon on Num. 23:19 (1743), JE Collection (Beinecke Rare Book and Manuscript Library, Yale University). Cf. Yale-Works 3:126 and “Miscellanies” No. 241, Yale-Works 13:358. 37. See Anderson’s discussion on whether ideas can exist without being perceived in which he examines JE’s theory of “supposed” existences ordained by God, in “Editor’s Introduction,” Yale-Works 6:107-08. 38. “The Mind” No. 26, Yale-Works 6:350. 39. “The Mind” No. 29, Yale-Works 6:352. 40. Yale-Works 3:401. Cf. Yale-Works 6:234. 41. MS sermon Num. 23:19 (1743), JE Collection. Cf. “Miscellanies” No. 1263, Yale-Works 23:202. 42. “Miscellanies” No. 629, Yale-Works 18:157-58. 43. “The Mind” No. 10, Yale-Works 6:341-42. 44. Ramsey, “Editor’s Introduction,” Yale-Works 1:35, 118. 45. Charles J. McCracken (Malebranche and British Philosophy [Oxford: Clarendon Press, 1983]) and Norman Fiering (“The Rationalistic Foundations of Jonathan Edwards” in Jonathan Edwards and the American Experience, eds. Nathan Hatch and Harry S. Stout [Oxford and New York: Oxford University Press, 1988], 73-101) have shown several striking parallels between JE and Malebranche. For instance, both taught that God is “Being in general,” the world is an ideal one, and God is the only and immediate cause. Cf. Monte Cook, “The Ontological Status of Malebranchean Ideas,” The Journal of the History of Philosophy 4 (Oct. 1998): 525-44; Stephen Nadler, Malebranche and Ideas (Oxford and New York: Oxford University Press, 1992). 46. Lee, Philosophical Theology, 35. 47. Miller (Jonathan Edwards, Men of American Letters Series [New York: William Sloane, 1949], 121-22) and Alan Heimert (Religion and the American Mind from the Great Awakening to the Revolution [Cambridge: Harvard University Press, 1966], 73) have emphasized JE’s opposition to the notion of an efficient cause. 48. Yale-Works 1:152, 156. For a discussion on JE’s distinction between “moral and natural necessity,” see Ramsey, “Editor’s Introduction,” Yale-Works 1:34-37. 49. God’s knowledge is an important topic in Freedom of the Will and several “Miscellanies.” JE never doubts the eternal completeness of God’s perfect knowledge. It is upon this supposition that he strenuously argues against Arminian “contingency” theories. Yale-Works 1:257-73; and “Miscellanies” No. 1154. 50. This statement might lead into a discussion of JE’s doctrine of providence, in which he distinguishes between God’s “arbitrary” and “natural” operations, but I defer to Lee, Philosophical Theology, 68-75. 51. Lee, Philosophical Theology, 40. 53. Anderson, “Editor’s Introduction,” Yale-Works 6:53. 54. “Natural Philosophy,” Yale-Works 6:186-87; “The Mind” No. 10, Yale-Works 6:342. Despite JE’s 1753 confession: “it happens I never read Mr. Hobbes” (Yale-Works 1:374), “Natural Philosophy” indicates that he at least came across excerpts or summations of Hobbes’ philosophy through secondary writers. 55. JE picks up where Locke and Newton were unsure what the substance that supports the properties of bodies might be: “it follows that the opinion that philosophers used to have concerning a certain unknown substance, which they used to say it was impossible for a man to have an idea of, is nothing at all distinct from solidity itself; or, if they must needs apply that word to something else that does really and properly subsist by itself and support all properties, they must apply it to the Divine Being or power itself” (Yale-Works 6:215). 57. Yale-Works 6:235. Cf. Wainwright, William J., “Jonathan Edwards, Atoms, and Immaterialism,” Idealistic Studies 12 (Jan. 1982): 79-89. 58. Lee, Philosophical Theology, 54. 59. Yale-Works 6:391-92. Robert Jenson is correct to note that “‘Spiritual’ does not here have primarily the sense of invisible, but rather of personal, indeed communal” (America’s Theologian: A Recommendation of Jonathan Edwards [Oxford and New York: Oxford University Press, 1988], 17). Aside from stressing the importance of keeping this shift in emphasis in mind, I would make an amendment by changing “communal” to relational. 60. Lee, Philosophical Theology, 48. 61. “Miscellanies” No. 94 and 259, Yale-Works 13:262, 367. Holbrook alludes to this when he notes that JE deposits at the onset both value and power in being itself. Value did not have to be imported from elsewhere into the realm of power, since both were inherent in being. Holbrook concludes by saying, “God does not create value, law or ethical essences which He then obeys. They are constitutive of being itself” (Ethics of JE, 136). Cf. Delattre, Roland., Beauty and Sensibility in the Thought of Jonathan Edwards: An Essay in Aesthetics and Theological Ethics (New Haven: Yale University Press, 1968), ch. 3. 62. Bodies and sentient entities differ in that the latter’s dispositions are designated a locus, which JE calls “substance.” This is further explained in my Jonathan Edwards’s Vision of Reality, chapter 9, as an improvement upon Lee. 63. “The Mind” No. 1, Yale-Works 6:337. 65. “Editor’s Introduction,” Yale-Works 6:84; cf. Delattre, Beauty and Sensibility, 117-84. 66. The Nature of True Virtue, Yale-Works 8:551. 67. See Lee, Philosophical Theology, ch. 7. 70. “The Mind” No. 45, Yale-Works 6:365. 71. Lee, Philosophical Theology, 78. 72. Ibid. Cf. “Miscellanies” No. 125[a], Yale-Works 13:288. 75. “The Mind” No. 1, Yale-Works 6:338. 76. Cf. Augustine, On the Holy Trinity in The Nicene and Post-Nicene Fathers, vol.3, ed. Schaff, 125, 143, 156. JE was aware of Augustine’s work through Chevalier Ramsey. See “Miscellanies” No. 1253, Yale-Works 23:184ff. 77. Fiering, Moral Thought, 51. 78. See The Nature of True Virtue, Yale-Works 8:551. There is no record of JE preaching this text. 79. Fiering, Jonathan Edwards’s Moral Thought, 60.